Taille de cet aperçu PNG de ce fichier SVG : 531 × 324 pixels. Autres résolutions : 320 × 195 pixels | 640 × 391 pixels | 800 × 488 pixels | 1 024 × 625 pixels | 1 280 × 781 pixels. A modified version of Image:Extinction Intensity.svg. Time runs from left to right (millions of years ago). Vertical axis is percent of species lost. Text removed so wikilinks can be floated over. See w:Template:Annotated image/Extinction for implementation. Cubic polynomial removed as this doesn't convey any useful information and is mainly an artefact. This figure shows the genus extinction intensity, i.e. the fraction of genera that are present in each interval of time but do not exist in the following interval. The data itself is taken from Rohde & Muller (2005, Supplementary Material), and are based on the Sepkoski's Compendium of Marine Fossil Animal Genera (2002). Note that these data do not represent all genera that have ever lived, but rather only a selection of marine genera whose qualities are such that they are easily preserved as fossils. In the original version of this chart, the "Big Five" mass extinctions (Raup & Sepkoski 1982) are labeled in large font, and a variety of other features are labeled in smaller font. The two extinction events occurring in the Cambrian (i.e. Dresbachian and Botomian) are very large in percentage magnitude, but are not well known because of the relative scarcity of fossil producing life at that time (i.e. they are small in absolute numbers of known taxa). The Middle Permian extinction is now argued by many to constitute a distinct extinction horizon, though the actual extinction amounts are sometimes lumped together with the End Permian extinctions in reporting. As indicated, the "Late Devonian" extinction is actually resolvable into at least three distinct events spread over a period of ~40 million years. As these data are derived at the genus level, one can anticipate that the number of species extinctions is a higher percentage than shown here. Many of the extinction events appear to be somewhat extended in time. In at least some cases this is the result of a paleontological artifact known as the Signor-Lipps effect (Signor & Lipps 1982). Briefly, this is the observation that inadequate sampling can cause a taxon to seem to disappear before its actual time of extinction. This has the effect of making an extinction event appear extended even if it occurred quite rapidly. Hence, when estimating the true magnitude of an extinction event it would be common to combine together the events occurring over several preceding bins as long as they also show excess extinctions. This explains why many estimates of the magnitude of an extinction event may be larger than the 20-30% shown as the largest single bin for most of the extinctions shown here. Raup, D. & Sepkoski, J. (1982). "Mass extinctions in the marine fossil record". Science 215: 1501–1503. DOI:10.1126/science.215.4539.1501. Rohde, R.A. & Muller, R.A. (2005). "Cycles in fossil diversity". Nature 434: 209-210. DOI:10.1038/nature03339. Sepkoski, J. (2002) A Compendium of Fossil Marine Animal Genera (eds. Jablonski, D. & Foote, M.) Bull. Am. Paleontol. no. 363 (Paleontological Research Institution, Ithaca, NY). 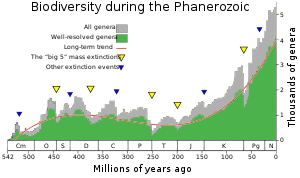 Signor, P. and J. Lipps (1982) "Sampling bias, gradual extinction patterns and catastrophes in the fossil record", in Geologic Implications of Impacts of Large Asteroids and Comets on the Earth, I. Silver and P. Silver Eds, Geol. Soc. Amer. Special Paper 190, Boulder Colo. p. 291-296. 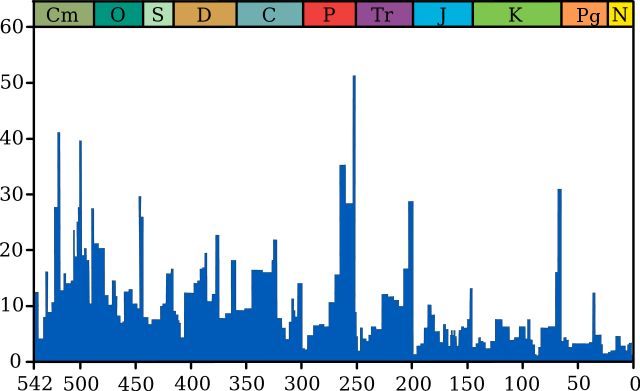 Total Phanerozoic biodiversity during the same interval. Note that this is a result of changes in both the rate of extinctions and the rate of new originations. The Dresbachian extinction event in particular is obscured by nearly immediate replacement with new genera. Ce document provient de « https://fr.wikipedia.org/wiki/Fichier:Extinction_intensity.svg ».